You could refer Josh Allen as a late bloomer as he wasn’t one of the best football players on his team while in college, subsequently, he rose from being a novice to a Pro. He currently plays as a quarterback in the National Football League (NFL) as he was drafted in 2018. As a college athlete, Josh played for the Reedley Community College in California and recorded 26 touchdowns and 285 yards in addition to 66 rushing yards in a game. A lot of people have referred to him as the big arm of the Buffalo Bills as a result of his incredible skills in performing a throw and his ability to control his arms while at it. With an amazing ability like that, you could bet Josh has an interesting profile despite being new on his team. Find out more about him here. Allen Josh was born on May 21, 1996, in Firebaugh California. Josh’s extended family emigrated from Sweden in 1907 and settled at Firebaugh California. He grew up amidst farms as it was his paternal grandfather’s occupation since 1975. The quarterback became a graduate of Firebaugh High school in 2014 and further attended Reedley College. He was a die-hard fan to the Fresno State University football team, he paid obeisance to them by attending their games and also their camp events. Having developed a keen interest in the game of football, his father tried within his capacity to get him a sports scholarship through the Bulldog’s coach Tim DeRuyter but he didn’t succeed. As the days rolled by, Josh never received any scholarship program including the NCAA Division I program, nevertheless, he got an offer from San Diego State which he rejected because he never saw a light to his career with them. Consequently, he decided to send a mass mail to various coaches, coordinators and quarterback coaches. Finally, he got two responses; one from Eastern Michigan and the other from Wyoming. He took Wyoming’s offer after Eastern Michigan called to cancel. Josh Allen played with zeal in his first year with Wyoming as he started in two games. He couldn’t continue that season as he sustained a broken collarbone injury earning him a redshirt. The young footballer later returned to the game in 2016 and became a starter for the team and also led them to a bowl game. Josh played over 14 games and recorded 56% of passes for 3, 203 yards throws, 28 touchdowns in addition to 15 interceptions. One record in those games that wouldn’t be easily forgotten was his game against the Brigham Young University where he recorded 17 for 32 having 207-yard throws, two touchdowns in addition to two interceptions. By 2017, he played in 11 games where he completed 56.3% passes for 1812 yard throws, 16 touchdowns in addition to 6 interceptions. His performance was incredibly low which resulted in a drop on his yards per attempt record to two full yards recording 6.7. Furthermore, his team played against the Cowboys in their bowl game where Josh Allen recorded one of the most incredible numbers having 11-for-19 with 154 throw yards, three touchdowns, and no interceptions. His record gained him an audience with the NFL and he also became a person of interest for the 2017 NFL draft. His dreams of joining the NFL that year shattered as his dad advised him against his actions. With so many contemplations, a lot of people further gave their remarks on why the quarterback opted out of his dreams which led to a report given by the American sportswriter and analyst Adam Schefter to ESPN that Allen may likely be among the top Prospects for the NFL draft the following year and as he said, it came to be. 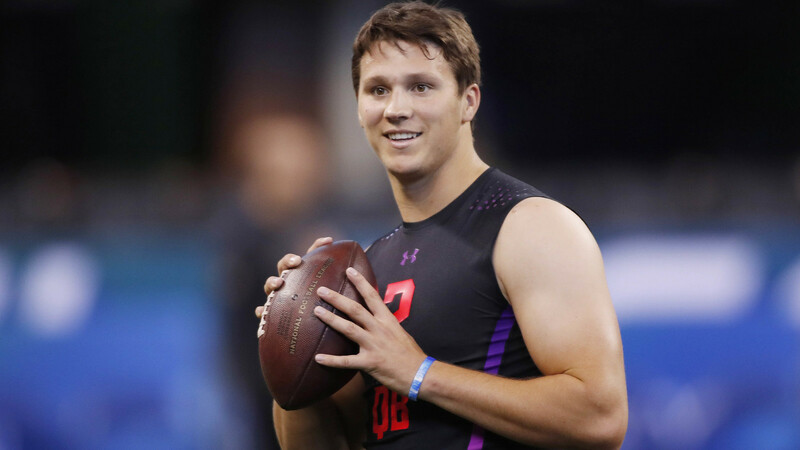 Josh Allen signed a four-year contract worth 21 million USD with the Buffalo Bills after he was drafted as the seventh overall pick by NFL. He started the season in a game against the Baltimore Ravens where he completed 6-15 recording 74 passing yards. He kept at a good pace and played against the Los Angeles Chargers and finished with 245 passing yards attaining 1 touchdown in addition to 2 interceptions not leaving out an extra rush of 32 yards. Subsequently, his team recorded a win against the Minnesota Vikings where he had 196 passing yards and one touch down in addition to 39 yards and two rushing touchdowns. Everyone had a view of the quarterback player Josh Allen since he recently hit stardom. Nicknamed as one of the big arms of the Buffalo Bills, he possesses a pair of arms that would perform a massive throwback, especially on a tight end. A vertical throw by the quarterback can easily hit a deep comeback as he pushes the ball with a calculated amount of force and pressure to hit this height. Most quarterbacks haven’t recorded an excellent stretch but as for Josh, he performs it with ease especially on the field and has also performed an amazing throwback which has consistently wowed his audience. The footballer has a weight of 237 pounds (108 kg) and a height of 6 feet 5 inches or 196 cm, he has riped his physique to serve him good purposes on the field as a defense against his opponent. Above all the strengths he has gathered, we still think he needs to work on his mental growth in order to gain adequate attempts during throws. He takes poor decisions especially when the ball gets away from him and also gives errant passes. Having been praised for the control he has on his weight, he also needs to work on controlling his foot in order to gain accurate balance with his lower body and shoulders. Nonetheless, Josh Allen is still new to the game professionally we hope he improves his skills and also in his game. Josh Allen is a handsome dude and if we say he doesn’t have a girlfriend then we wonder how you would feel. He met his love, Brittany Williams (who claims she is Beyonce’s lookalike on most of her Instagram pages) at a game in high school. He was her crush all the while and she was also a cheerleader at Fresno State University. In April 2018, the duo celebrated their one year anniversary of being together and also uploaded several pictures expressing their love to one another.